Though the first maps of Mars date back to the early 17th century, mankind’s first “close encounter” with the red planet was in 1965, when the American probe Mariner 4 sent back 21 images. Thanks to the prevailing political environment stimulating the space race between Americans and Soviets, it was only 4 years later that mankind took its first steps on the Moon. Whilst other lunar landings followed, with the end of the Cold War space exploration concentrated more on scientific and research aspects, centred on the use of the space shuttle and space stations. Now, fuelled by the success of the two Mars Rover projects and the commitment of US President George W. Bush in January 2004, a new impetus has been injected into space exploration with the prospect of a return to the Moon, this time as a staging post for mankind’s ultimate challenge – the conquest of Mars. The programme is highly ambitious: robotic exploration of the Moon in 2008; a new Crewed Exploration Vehicle (CEV) in the same year; the first CEV flight in 2014; extended human space missions by 2015 and a return to the Moon by 2020. The challenges are immense and the questions remain as numerous now as they did before the first moon missions. NASA’s recent successful test of the revolutionary X-43A scramjet aircraft, 100 years after the first human flight, is the shape of things to come. But numerous other obstacles will have to be overcome, the solutions to which will undoubtedly bring further innovations and new technology that will ultimately benefit mankind as a whole. Today’s planners do at least have a head-start over those entrusted with the Apollo missions. In the infancy of space exploration, these pioneers were essentially faced with a blank piece of paper, with no existing space technology to build on. Every component, every item of equipment had to be tested to its limits before being approved for use in space. Even the wristwatches chosen for the astronauts had to pass tests that many of today’s watches would fail. 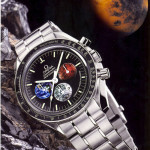 So tough were the tests in fact that only one watch was still working at the end: the Omega Speedmaster. It was therefore purely on its own merits that this Omega chronograph became the only watch to be flight-qualified for manned space missions and subsequently the first and only watch to be worn on the moon. 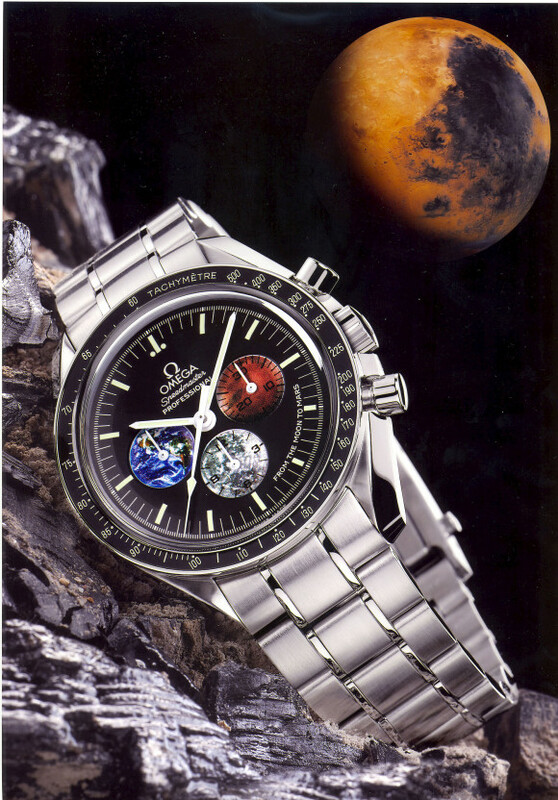 The Soviets subsequently equipped their cosmonauts with the same watch as the Americans, though since they covered their needs through anonymous government purchase orders, the people at Omega were none the wiser. Although the company’s association with space exploration came about without it knowing, Omega has since maintained a close relationship with the major space agencies and some of the astronauts that have worn the Speedmaster. In the year that we celebrate the 35th anniversary of the moon landing that catapulted the Speedmaster into watchmaking stardom, the Omega Speedmaster Professional remains as popular as ever, with its “flight-qualified” credentials still serving as a guarantee of its robustness and precision. Having successfully withstood the journey to the moon and a short stay on its surface during various Apollo missions, the Speedmaster could quite conceivably return there with the astronauts in 2020. However, a voyage to Mars would impose new constraints on watches and timekeeping (and, no doubt, even stricter tests by NASA). In addition to coping with an average temperature of -53°C, as well as local, regional and global dust storms, the Mars watch may also need to take into account the longer Martian day (the “sol”), which is equivalent to 1.027 Earth days. Leaving the designers and watchmakers to ponder these new, tougher specifications, Omega is pleased to introduce a special timepiece to record this new turning-point in space exploration. The special-edition Speedmaster “From the Moon the Mars” bears all the hallmarks of the original “Moon Watch”, with the same robust case, functional bezel with tachymeter scale and sober matt black dial with luminous baton hands. It also shares the hand-wound calibre 1861 that is legendary among mechanical watch enthusiasts for its precision and reliability, offering a power reserve of 45 hours when fully wound. The transfers of the Earth, the Moon and Mars in the chronograph counters and small seconds counter on the dial clearly indicate the commemorative purpose of this timepiece, as does the inscription “From the Moon to Mars” found on the dial between 5 and 3 o’clock as well as engraved on the case back. As a further touch of exclusivity, each piece also bears its own individual sequential number on the case back. One thing that’s sure is that when mankind does eventually return to the moon, these special Speedmaster models will still be ticking away, just as the first watch worn on the moon – lost for over 30 years but found again last year – is still going strong. And in the meantime, we will continue to innovate and pioneer in its field, working to ensure that, if any member of the human race sets foot on Mars, he or she will do so wearing an Omega. This entry was posted in Press Release, Speedmaster Professional and tagged 3577.50.00, Moon to Mars, Moonwatch on April 19, 2004 by Dale Vito.